The toddler bed has been going great. 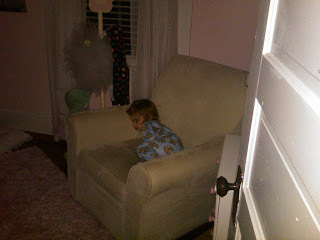 Yesterday when I went to get Anabelle up from her nap, I found her sitting in her chair. The chair was really warm, and she looked like she just woke up. I told Josh that if I didn't know better, she probably slept in her chair. Well, this is how I found her when I went upstairs to go to bed. Sorry for the poor quality- I never know when I need to take the big camera up.